Touch is the message of today’s gospel reading. The poor man Lazarus was untouchable, except by the dogs who licked his wounds! He was one of the invisibles, one of the people that we choose not to see because they might trouble our conscience or our easygoing relationship with life. And he who did not touch Lazarus when he lay at his doorstep wanted to be touched by Lazarus in Hades. Touch or the lack of it joined them in life and in death. One refused, the other couldn’t because of the chasm. There is an important message here: Be careful about what or who you reject! It leads to hardness and coldness of heart. That’s not exactly what happens in the parable, but the chasm that separates the two men after death is a symbol of the chasm that opens in our lives when we refuse to reach out and touch. We need to start seeing our Liturgy as missional. What happens in the Liturgy? The Lord touches us and we touch the Lord – in communion, of course, but also when we greet and embrace each other! At the end of Liturgy, we hear the words, “Let us depart in peace” and we respond, “In the name of the Lord.” We leave the Liturgy “in the name of the Lord” by going out to touch the world as Jesus touched the world. “In the name of the Lord” means as representatives of the Lord, standing in the place of Jesus, doing what he would do! Too bad our Liturgy became a little cluttered with extra words over the centuries, but those words at the end capture the mission of Liturgy. Liturgy teaches us that we are here for the life of the world. This is the Church’s moment, like it was 2,000 years ago. The world has lost meaning, like it did 2,000 years ago in the Roman Empire. The gospel spread like wildfire because it touched people with a genuine message and fellowship. People wait for the second coming of Christ – but is it possible that the second coming has been present in the world for these 2,000 years? Of course we believe in the future return of Christ in glory, but is Christ not already present in the world? Is he not present in people like the poor man Lazarus (“inasmuch as you did it to one of the least of these you did it to me”)? And is he not present in every one who strives to live as a disciple of Christ? Today’s saints are an example of that “second coming” that I speak of, the one already present in the world! 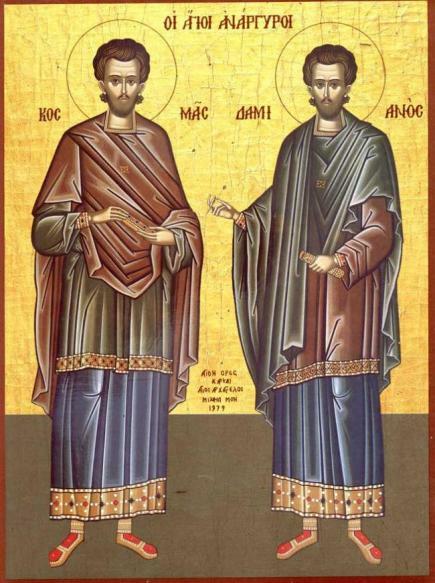 Saints Cosmas and Damian were twin brothers who lived in the 3rd century. 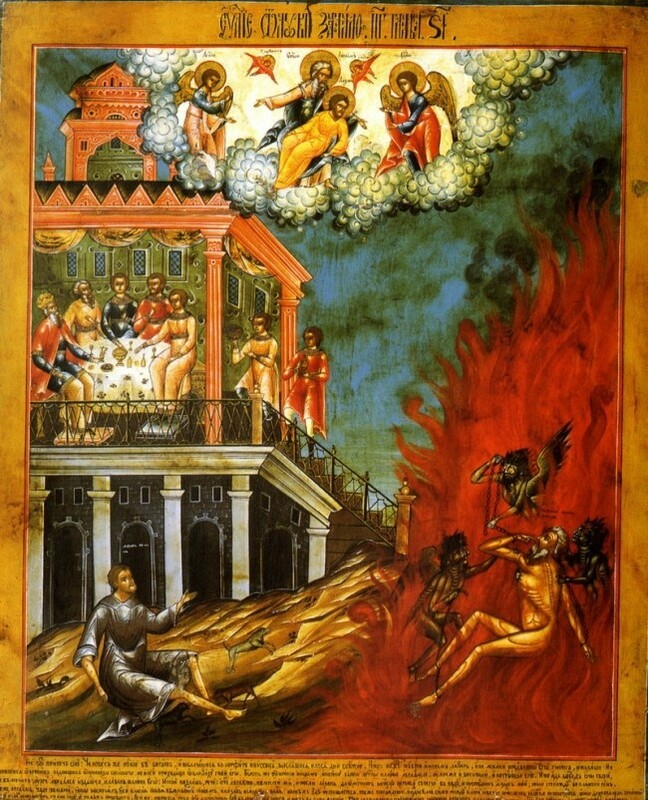 They were physicians and are venerated among a whole group of saints in the Orthodox Church who are called “Unmercenaries” because they healed without receiving payment. And they not only attended to human illnesses, but they also healed animals. 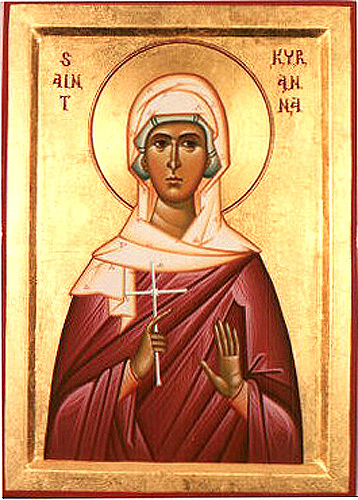 On this same day (Nov. 1st) the Orthodox Church also commemorates Saints Cyrenia and Juliana, two women who dedicated their lives to helping orphans and widows, gave monetary and material aid whenever they could, always expecting nothing in return. They died as martyrs in the early years of the 4th century. These unmercenary saints are like the woman who anointed Jesus’ feet – because “she loved much.” Jesus touched our humanity because He loved much! “Love never ends,” Paul told us today in that marvelous reading. It never ends because there are always unmercenary disciples of Christ who are touching the wounds of humanity. This is the only way the church can be the church! Not by building monuments to our own egos, not by shutting ourselves off in religious or ethnic ghettos – but by touching people with unmercenary love, expecting ABSOLUTELY NOTHING in return or as response, including conversion. Love with no strings attached. Being people of the second coming! Categories: Global Visions, Sermons | Tags: Parable of Rich Man and Lazarus, Unmercenary Saints | Permalink.